For many of us who want to have younger-looking skin, without resorting to cosmetic procedures and surgery, a few tips and tricks for “anti ageing make up” can go a long way. In fact, these are some of the most powerful secrets of Hollywood actresses who seem to defy ageing and remain young-looking well into middle age. First, before you even consider make up, make sure that your skin is in good condition “from the inside” as no amount of make up tricks can really hide unhealthy skin. This means getting enough sleep (few things age you faster than a poor night’s sleep, resulting in puffy eyes and sallow, dull and sagging skin) and eating a healthy, balanced diet high in whole grains, fresh fruits and vegetables. It also means making sure that you are hydrated all the time, as dehydration will quickly cause your skin to look dry, sallow and dull. Be aware of this especially if you spend a lot of time indoors with the drying effects of central heating and air-conditioning. Next, stay out of the sun and lather up the sunscreen. If this seems like boring advice that you’ve heard a thousand times before, that’s because it works. Many “middle-aged beauties” famously avoid the sun because they know that UV radiation is the No. 1 cause of prematurely-aged skin. Anytime you are planning to be outdoors, even if you’re just riding in a car, make sure that you apply a sunscreen or a moisturiser with sunscreen included – with a minimum of SPF15, even in winter. Tip # 1 – Get your make up done by a professional. This does not mean that you have to employ a full-time make up artist! 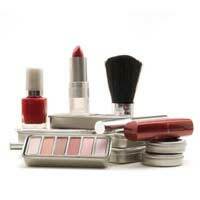 However, many make up counters in department stores and pharmacies offer makeovers and consultations for a fee which can then be redeemed against any products. If you are planning to re-stock your make up collection anyway, why not take advantage of this “free” professional advice? Having a make up artist explain how to make the most of your features and hide any signs of ageing can be incredibly useful. If you ask for the makeover to be directed towards “every day, natural make up”, then you can receive guidance which you can rely on for your every day beauty routine. Tip # 2 – Choose creamy blushes and shadows when stocking up your make up collection. As your skin ages, it will become drier so creamy blushes and shadows are more appropriate. They are also less likely than powder blushes and shadows to settle into fine lines and wrinkles – in fact, creamy products can have a “plumping” effect on your skin. Tip # 3 – A good moisturiser is crucial. Younger looking skin is all about hydrated and plump looking skin. A moisturiser appropriate to your skin type will help to hydrate and plump out the skin, as well as provide a barrier to prevent excessive loss of moisture and to protect the skin from the elements. It also provides a good base for your make up to sit on, so that it will last longer and blend better. Tip # 4 – Unless you have excessively oily skin, try to avoid using powder during the day as this can settle into your fine lines and wrinkles and make them appear deeper. Save the powder for going out at night. Tip # 5 – Foundation is important for evening out the complexion and hiding blotchiness and other facial imperfections, as well as providing a good base for the rest of your make-up. However, be careful about applying too much, especially as you get older. A mask-like thickness can actually age you even more. It is best to choose a sheer, moisturising foundation that will help to keep your face hydrated and young looking. Tinted moisturisers are also a good choice, as they provide a more natural look. Tip # 6 – When selecting foundation, choose a shade that is slightly lighter than your normal skin colour. This gives you a younger, fresher look. Never ever choose a foundation that is darker than your skin colour, even if you think you look too pale. Use bronzers and blushers to add colour. Tip # 7 – Invest in a good highlighter – this will help to illuminate your face and help to disguise dark circles under the eyes and wrinkles on your face. Highlighter will also help to offset any general dullness and give your complexion a glow. Consult a make-up artist on the best way to use a highlighter to flatter your face. Tip # 8 – Concealer is great for hiding blemishes and for disguising under-eye circles, which can make you look old and tired. The key with concealers is choosing the right shade and then blending well. If you are applying foundation on top, blend that in thoroughly as well. Tip # 9 – Spend time finding a blush that gives you a natural, rosy flush. This will give you a fresher, younger look. The best colours are warm shades, such as peach or salmon, and cream formulations often suit older skin better. Tip # 10 - Consider investing in an anti ageing retinoid cream. Retinol is one of the few ingredients which have been scientifically proven to have a genuine effect on reversing the signs of ageing. Some retinoid creams have to be prescribed by dermatologists but now, many over-the-counter versions have also become available, although these will often contain lower levels of active ingredients. Be aware, though, that retinol can irritate skin and increase sensitivity to the sun – if in doubt, consult a dermatologist.